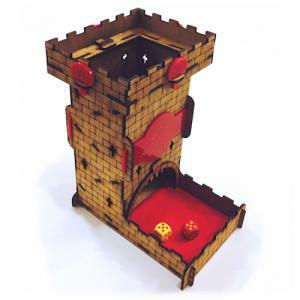 A dice tower is one of the coolest and most useful gift for the tabletop game lovers! Meeples Castle Dice Tower randomizes dice then collects them in a fabric covered catchment tray. No more searching underneath the sofa for rogue dice or re-positioning toppled game pieces. And no more of those questionable throws from your friend who's always "lucky." Put an end to the chaos with the Meeples Castle Dice Tower.